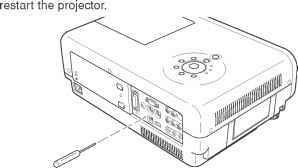 This projector provides a function which can be specified a defective area simply by indicating the LEDs on the con trol panel. Connect the AC cord and press the Power button once and then check the LED indication. SW905 opens when the surrounding temperature of the switch exceeds 100°C. - When the WARNING (red) and POWER(red) indicators are flashing, the symptom indicates that the projector detected an abnormal temperature risen inside the projector. Check the air filters and remove the object near the intake and exhaust fan openings, and wait until the POWER indicator stops flashing, and then try to turn on the projector. The internal temperature is monitored by sensor ICs, IC8801 and IC8811 on the Main board and IC2831 on the Temp Sensor board. - When the WARNING indicator lights red, the symptom indicates that the projector detected an abnormality in the cooling fan operation or in the power supply secondary circuits. Check fan operation and power supply lines, and the driving signal status. The P-FAIL signal (Error: L) is sent to pin 184 of IC801<SUB CPU> when the abnormality occurred inside the projector, and then the IC801 sends the shut down signals, IC_RESET and LAMP_SW, to the power supply circuit and lamp ballast circuit to stop the operation. Check power supplies 7V, 5V. P-FAIL-L signal becomes "Low" when the abnormality occurs on any of these power supply lines. Check power supplies 15.5V, 12V, 15.5VMT. P-FAIL-H signal becomes "Low" when the abnormality occurs on any of these power supply lines. Check the Power DC board. P-FAIL-P signal becomes "Low" when the abnormality occurs in the Power DC board. The FAN_LOCK signal (Error: High) is sent to Q4801 when one of the fans stops operating. The FAN_LOCK signal is applied to pin 19 of IC1811 <I/O Expander> by the name of FAN_DET signal and then IC801 detects an abnormality. Check fans FN901, FN902, FN903, FN904, FN906, FN907 and FN908 and peripheral circuit. The LAMP_SW signal (Power-on:H) is output from pin 206 of IC801 and applied to pin 2 of IC4801.The P-FAIL signal is applied to pin 1 of IC4801. The IC4801 outputs the LAMP_SW signal to the lamp ballast unit through the Lamp Cover switch(SW902). LAMP_RXD signal at the pin 3 and LAMP TXD signal at pin 1 of IC801 are used for communication with the lamp ballast unit through the IC4806. If the abnormality occurred on the lamp ballast unit, IC801 detects the abnormality by these signals and shuts off the lamp driving circuit. Make sure that the lamp cover is mounted correctly. If not or the lamp cover removed, the lamp does not light on for the safety. Check the lamp cover and lamp cover switch (SW902).